While you may get the urge to pull out a gun every time that loudmouth in your office starts rambling, common courtesy and a number of laws suggest that’s not the right way to go about regaining your peace. 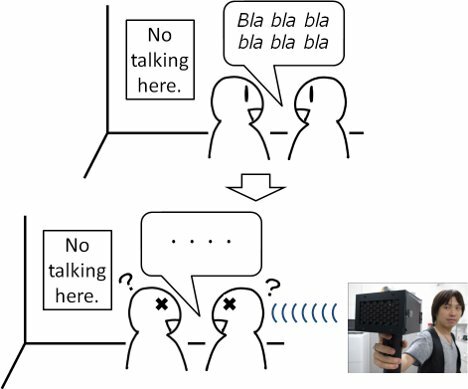 A team of researchers has developed a silencing gun called the SpeechJammer that serves to shut people up with no pain or risk to you or them. The SpeechJammer consists of a directional microphone, a distance sensor, and a directional speaker that all work together to provide you with blissful silence. You point the device at the offending jibber-jabberer and the mic records his speech. 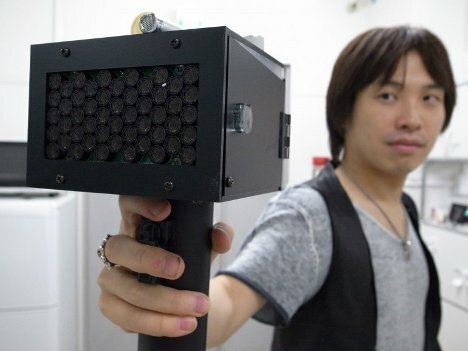 After a delay of a fraction of a second, the directional speaker plays the target’s words right back at him. The distance sensor tells the device how far away the target is so that the delay can be kept consistent. Thanks to the way the human brain processes its own speech, this nearly-instant but slightly offset playback serves to trip up the speaker. It is possible to continue talking even when the device is being used on you, but it is no easy task. The SpeechJammer doesn’t cause any pain or discomfort; it just makes it really hard and kind of unpleasant to continue talking, which seems like the perfect punishment for an over-talker. See more in Weird Science or under Science. March, 2012.